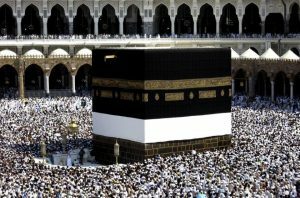 The Sacred Mosque in Mecca can accomodate up to four million people, and surrounds the K’aba – a cuboid building that is the holiest place in Islam. This Mosque covers 400,800 square metres (99 acres), and has outdoor and indoor lavish praying spaces. The cost of its construction exceeds $100 Billion, making it one of the world’s most expensive buildings. In 2015, Saudi Arabia spent an additional $3.6M to renovate the door of the Ka’ba. Made from heavy gold, it is more than 3 metres high and features 15 of the 99 names of Allah embroidered in gold and silver Thuluth (an Arabic calligraphy style), according to the Makkah Daily. 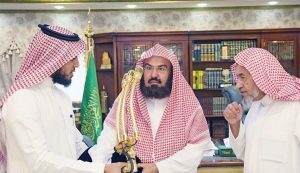 The President of the Grand Mosque, Sheikh Al Sudais, has received the Mosque’s new microphone, which was specially designed to carry sophisticated audio amplification devices. The President then praised the efforts of the Operation and Maintenance Department in seeking to develop everything that would provide the best service in the Mosque. 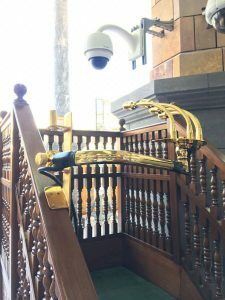 The microphone holder is made of gold plated metal, instead of high quality wood. The microphone itself is of golden structure, with golden cables and leads. It will be used to conduct daily prayers for poor and ill Muslims. The kingdom is spending more than $20 billion renovating and expanding the site. Millions of Saudi residents are socioeconomically disadvantaged. The government does not publicize statistics mapping poverty in the country either. As much as 20 percent of Saudi residents live in “crippling” or “severe” poverty. Private estimates suggest that in Riyadh alone poverty affects about two to four million people. Yet the Islamic Government believes that it is reasonable to spend tens of billions of dollars on doors and microphones to use them while praying for the poor and needy. 1- Leeda Jewayni, “Poverty in Riyadh, Saudi Arabia,” The Borgen Project, 24 September 2014, http://borgenproject.org/poverty-riyadh-saudi-arabia/. 2- Aryn Baker, “Rich Nation, Poor People,” TIME Magazine, 23 May 2013, http://time.com/3679537/rich-nation-poorpeople-saudi-arabia/. 3- Danielle Koontz, “Malnutrition in Saudi Arabia,” The Borgen Project, 31 May 2015, http://borgenproject.org/malnutrition-in-saudi-arabia/.